The wizard tower is a defensive tower with a wizard on top of it. The wizard shoot electric bolts to attacking troops. It deals splash damage to air and ground troops. It is good at killing large groups of low health troops like archers, barbarians or minions. It does lower damage per second then the mortar, but is fire rate is much higher. This makes it stronger at low range and an ideal defensive building to protect other close buildings. If you want to keep your trophies it is recommended to place the wizard tower close to your town hall. It can be more effective to place your wizard tower more to the outside of your village because of it’s low range. Wizard towers are ideal to cover your mortars blind spot. It is wise to use some troops as meat shield (giants or barbarians). Then you can destroy it with a group of archers. Watch out with groups of troops without distraction, they are killed very fast. When you take out the air defense first, the giant healer strategy works great against wizard towers. There is a wizard standing on the tower. You can’t train the troop. It just is there. 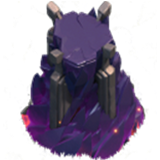 Having level 6, 7 or 8 wizard towers will scare of enemies. Let the wizard tower do its job. Defense strategy video.